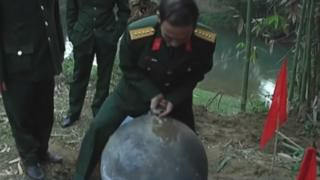 The largest object weighs about 45kg (99lb) and was found near a stream in Tuyen Quang province, the Thanh Nien News website reports. Another orb landed in local resident's garden in the neighbouring Yen Bai region, while the lightest, weighing 250g (9oz), came down on a nearby roof before rolling onto the ground, the website says. Local people reported hearing what sounded like thunder in the minutes before the objects were found. An initial investigation by Vietnam's defence ministry has so far determined that the objects are compressed-air tanks from an aircraft or rocket, and that - at least now they're no longer airborne - they aren't dangerous. It says the orbs were manufactured in Russia, but that its not clear if they were subsequently sold to another country for use. Aerospace expert Prof Nguyen Khoa Son thinks they could belong to an old satellite that failed to burn up in the Earth's atmosphere. But he tells the Vietnam Bridge website that the objects don't appear to be damaged, so they may be the result of a failed satellite launch.